In a rare communication, Netanyahu spells out his rationale for releasing terrorists, despite opposition by the public. Prime Minister Binyamin Netanyahu took the rare step Saturday evening of publishing a long missive to the Israeli public. In it, he explains why he has agreed to release 104 terrorists as a "gesture" accompanying "peace talks" with the Palestinian Authority. He also states that the talks need to last at least nine months. 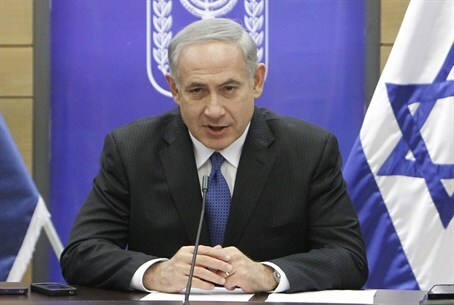 Netanyahu's messages to the public are usually delivered through much shorter communiques, or in interviews. His decision to opt for a relatively long letter may reflect his awareness that the Israeli public is solidly opposed to the terrorist prisoner release, and is generally fed up and cynical about “peace talks” that have been going nowhere for 20 years. "Prime ministers are occasionally required to make decisions that are contrary to public opinion, when the matter is one of importance to the state. "There is no need for prime ministers, in order to make decisions that enjoy the support of public opinion. "At this time, I believe it is very important for the state of Israel to enter a diplomatic process. This is important for fully exhausting the chances for ending the conflict with the Palestinians, and also for solidifying Israel's status in the complex international reality that surrounds us. "The huge changes in our region – in Egypt, Syria and Iran – pose new challenges before the state of Israel, but they also present considerable opportunities before us. "For these reasons, I believe that it is important that Israel enter a diplomatic process that will last at least nine months – in order to examine if an agreement can be reached with the Palestinians within that time. "But with all the importance that I attach to a diplomatic process, I was not willing to accept the Palestinian demands for retreats and [building] freezes as preconditions for entering into negotiations. "I was also unwilling to accept their demand to release Palestinian prisoners before the negotiations begin. I did agree to release 104 Palestinians in measured portions after the beginning of the negotiation and in accordance with its progress. "This is a tremendously difficult decision to make. It hurts the bereaved families, it hurts the entire nation of Israel and it hurts me very much. "It collides with an exceedingly important value – the value of justice. "It is a clear injustice when evil people are released before the end of their sentences, even if an absolute majority among them have served over 20 years in jail. "The decision is doubly personally difficult for me, because I and my family know personally the price of bereavement from terror. I know the pain well. I have felt it on a daily basis for the past 37 years. "The fact that Israeli governments that preceded those that I have headed released over 10,000 terrorists, does not make things any easier for me today, and did not make my decision to free Gilad Schalit any easier. "Bringing Gilad home involved an exceedingly difficult decision for me – the release of terrorists. But I believed that the value of briging our sons home must supersede that difficulty. "People in positions of leadership must choose between complex options, and sometimes the required decision is particularly difficult when most of the public opposes it. "Thus, I decided to end Operation Pillar of Defense after archterrorist Ahmed Jaabari was liquidated, and after the harsh blows that Hamas and the terror organizations received at the hands of the IDF. "I made the decision to end the operation although most of the public backed continuing it – something that would have required a ground offensive into Gaza. As prime minister I thought that the goal of deterrence had been largely achieved by the determined actions we took. "Today, about a year after Operation Pillar of Defense, we are witnessing the most quiet situation in the south in over a decade. Of course, this quiet can fall apart at any moment, but my policy is a clear one on all fronts: as far as possible, we prevent threats in advance, and we respond with force to any attempt to hurt our civilians. "In the next nine months we will examine if the Palestinian element that faces us wants to truly end the conflict between us, as we do. "This end will only be possible if the security of the citizens of Israel is assured, along with our vital national interests. "If we reach a peace arrangement of this nature, I will bring it to a public referendum. "A crucial decision like this must not be made on the cusp of a few votes in the Knesset. Every citizen must be allowed to directly influence our future in such a central question. "The best response that we give to those base murderers who wanted to defeat us through terror is that in the course of the dozens of years when they sat in jail, we have built a wonderful country and turned it into one of the world's most prosperous, advanced and powerful countries. "I promise that we will continue to do so.